The first few minutes of Bing Liu’s debut documentary drift by with a hazy confidence, the work of a filmmaker shooting from the heart. Skateboarding looks like a way of life, as one long summer of exhilaration, laughter, and the carefree immortality of the young. Time springs eternal. Compiling footage from over a decade of DIY filming – including his own days skating as a teen – Liu pieces together a heartfelt ode to the sport and the kids it fosters in the small town of Rockford, Illinois. Yet the film soon takes an inward turn, sussing out the inner lives of two skaters in particular: Keire, a young, aimless man with an open heart, who turns to skating as a way to assert some control in his life, an outlet for all his rage and anxiety and fears; and Zack, the charismatic centralizing figure of the local crew, twenty-three, making a living as a roofer, and expecting a baby with his girlfriend, Nina. The facade begins to give way slightly: the atomized acts of skating through the streets or practicing a trick over and over again until the bruises stand out as badges of your perseverance, these are the acts of an individual, and while it may offer a personal salvation at the moment, it is tried and found wanting, fallible in the face of new responsibilities and new desires, and new dreams. As Keire says early on, “soon the effect of the drug wears off.” Over years, we’re witness to Zack and Nina struggle under the weight of parenthood, fight, split up, get back together, a small epicycle of abuse plotting its course around their lives. While Keire is the heart of the film, a luminous personality who brightens the screen and becomes the most vulnerable on camera, Zack is a black hole – mysterious, dangerous, and slowly pulling everything into its orbit – whose event horizon Minding the Gap is lucky to escape. Zack is stuck in a loop of self-diagnosis; he knows and can verbally address his own shortcomings, often in sophisticated ways, which gives the false impression, especially on film, of dynamism, or at least a commitment to change. Yet lacks the ability to act on that knowledge, which only further depresses him and leaves him admitting to the pain he suffers and the pain he has caused. Liu could have easily centred the story on him, but digs deeper, unearthing more than one person can bear. In many ways, pain is at the heart of Liu’s film, and the reason why these men turn to skateboarding, the reason why these families begin to strain and crack. The pain of uncertainty, of feeling inadequate or insignificant, the pain of absent fathers – or worse, the pain wrought by those present. Pain through relationships, caused by role models, or loved ones, and our collective inability to wash ourselves from it. As the film progresses, Liu himself emerges from the periphery, at first present only through old camcorder footage or his voice asking questions, but then moving on to interviewing his half-brother about their childhood, to interviewing his mother, and bluntly asking her about his stepfather’s abuse (a powerful moment underscored when Liu crosscuts the scene with Keire adrift amidst a sea of tombstones, crying as he searches for his father’s grave). What began as an intimate ode to the simple joys of skateboarding while being young and carefree, a family drama of two young twenty-somethings raising a child together, and the struggle to make a living in a small city seamlessly slides into the spiralling pain of intergenerational trauma, domestic abuse, and toxic masculinity. 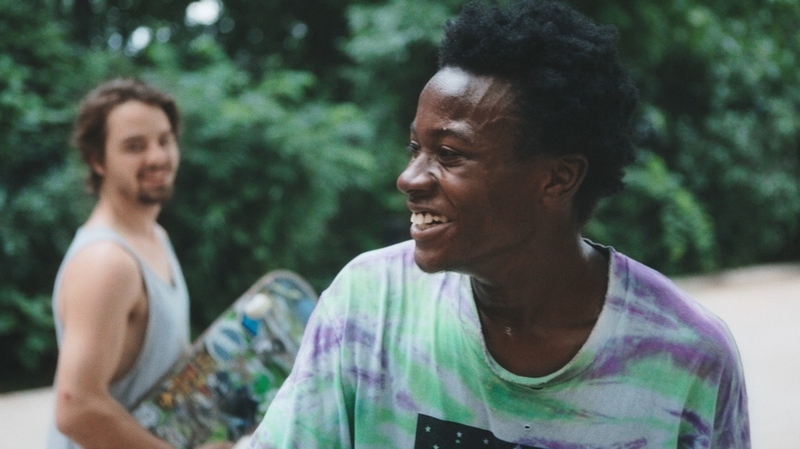 Occasionally operating like a one-way mirror as Liu burrows behind the walls of his friends’ personal lives, Minding the Gap ends up as more of a parallel mirror, as Liu finds an infinite regression of reflections. He sees himself in Keire, a fellow racial outsider among their peers, whose father was also abusive; he’s confronted with Zack’s abusive nature towards Nina – the cycle begun anew. The film glides between these people like a liquid. The sheer fluidity of the edits lights a fire under the film so that its entire apparatus seems vibrant and dances with energy. There’s urgency to their lives, to Liu’s introspection, to the staggering difference between hope and despondency that Minding the Gap bears on its shoulders.